Teachers of young children often use the phrase “use your words.” It usually refers to the idea of using words to express dissatisfaction with another child rather than hitting them. I also used to use the phrase to remind children to ask before joining in play, but I have had to rethink that. The problem is that most communication comes from nonverbal gestures. 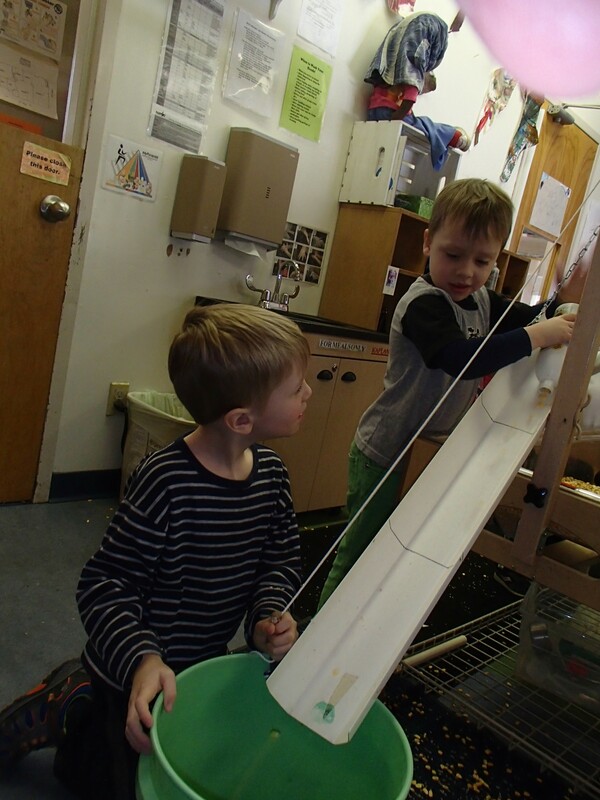 There are a lot of other skills besides using words that are needed to join others in play. For example, Greg and Neville are very close friends. They play together every day, often roughhousing. However, they do not start by asking if they can play rough. They have an understanding built on trust. Neville crashed into Greg. I take a few steps forward. Like a police officer, I am assessing the situation as I approach. Is anyone hurt? Is a fight about to erupt? Did a fight already in progress? Do I need to call for back up? Neville looks up at Greg (he is a full head shorter). Neville is smiling. Greg meets Neville’s eyes, and he smiles, too. Then Greg tackles Neville to the couch. They erupt into laughter. I look around to see if the area they have chosen is safe for this type of play. They wisely chose the couch. I know that in a few minutes, Neville will cry. It almost always happens that he will get bumped a little too hard. Greg will stop the play and ask if Neville is OK. Neville will cry for about thirty seconds and Greg will apologize. Then Neville will look at Greg’s face and smile. Greg immediately goes into play mode. The two are tackling each other. It always starts with non-verbal communication. The two know that they are playing. They often tackle each other once or twice before they even talk about what they are playing. After the initial greeting-tackle, one of them will suggest a scenario. Then play resumes. It is a mixture of verbal and non-verbal communication. If someone winces, the other often eases up. If someone starts laughing, the other will keep repeating the action that led to laughter. Sometimes they don’t even bother with a scenario. They simply enjoy the physical contact. Greg and Neville have an existing relationship that allows them to not use their words. What about a third child? Greg and Neville often are joined by others who read the body language. If the two of them are rolling on top of each other, another child might also roll on top of one of them. Usually it works. Once in a while someone will say “stop.” The other child stops and trust is built. If a new child joined our class, I would have to help them join other children who were playing. I find that the most successful way of joining others is not to ask, “Can I play, too?” The first step is non-verbal. The child needs to play with similar materials. If a child is drawing, draw near them. 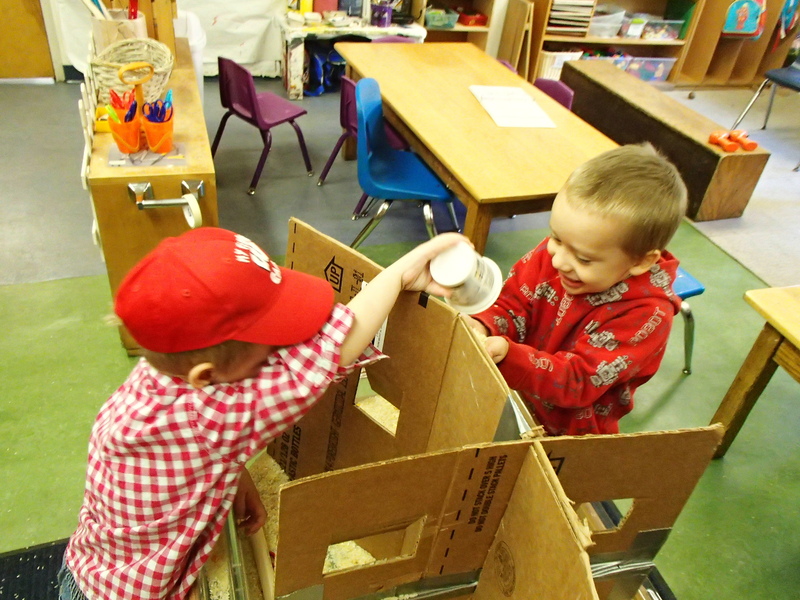 If they are building with blocks, build near them. They also have to position themselves in the same way as the child they want to play with. If the child is sitting on the floor, the other child should sit on the floor. If the child is sitting at a table, the child sits at the table. 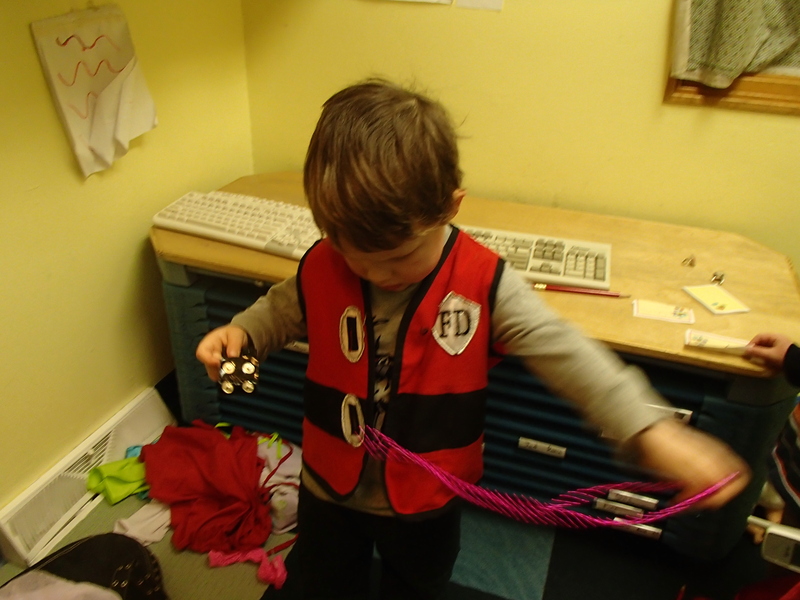 If the play involves movement, the child entering play needs to move as well. Children do need to use their words, but they need to express themselves with their actions as well. Reading books to preschoolers is one of my favorite things about my job. If the classroom is getting a bit too rowdy for me, I know I can pick up a book and start reading out loud. By the time I turn to the second page, a few kids gather around. Soon, most of the class is sitting around me listening. I love the way kids this age become so engaged with the story that they call out when they see something in the illustrations, or they anticipate some of the lines in the book. One of the most gratifying things as an author is reading my own books to kids. Now I hear kids call repeating words that I wrote. There is a child in another classroom at my center who has to point out each character on each page. “There’s Rita. There’s Johanna.” After pointing out everyone, he sits back down. When I turn the page, he stands up and points out everyone on that page. It’s great to have someone so excited about my book. One time I was at another childcare center to read. As I turned the page, the illustration shows Bree holding up a worm. A child rose to his knees and pointed and said, “Look, a worm!” I was just about to say, “You’re right. She does have a worm.” I was thinking I could ask how many of the kids have found a worm. But I didn’t say anything because a teacher scolded the child telling him to sit quietly so I could read. I read the rest of the book, but I didn’t have any other enthusiastic kids calling out. After the book I asked the kids questions and they asked me some questions. The kids had a lot to say, but every time they became a bit animated (kneeling, talking over each other) a teacher scolded them. It was hard to have a conversation because the teacher kept interrupting us. On my walk to the bus, I realized none of the teachers commented on my books with the kids (or me). They thanked me for reading to the kids, but otherwise the only time they spoke was to scold the children. It seemed that for the teachers the main learning experience was learning how to sit and wait for a turn to speak. I find this often happens in preschool classrooms. More attention is spent on obedience than on the learning experience. Children are often told to sit “crisscross applesauce.” This refers to sitting on the floor with legs crossed. In terms of learning, I have not been able to find a study that shows any more knowledge retention, or an increase in engagement when sitting this way. My own experience finds quite the opposite. I think one of the reasons children are asked to sit that way is so they don’t disrupt the attention of others who are listening to someone speak. I don’t think there is anything wrong with telling children that they need to make sure everyone can hear or see. But there are many ways to sit without disrupting others. It can even include children leaning on each other. I think this issue of enforcing compliance can lead to teachers scolding children more harshly. Rather than giving children a gentle reminder that someone behind them can’t see if someone stands in front of them, the teachers react as if the child is disrespecting them for not obeying. The child is just being a child who can’t sit in one position for long (just like many adults). If there is any disrespect happening, I think it might be coming from the teacher. My favorite day of the year is coming up next Friday, Painting Day. Each year we do some unique painting activities in the morning. In the afternoon, we turn my classroom into a giant painting. 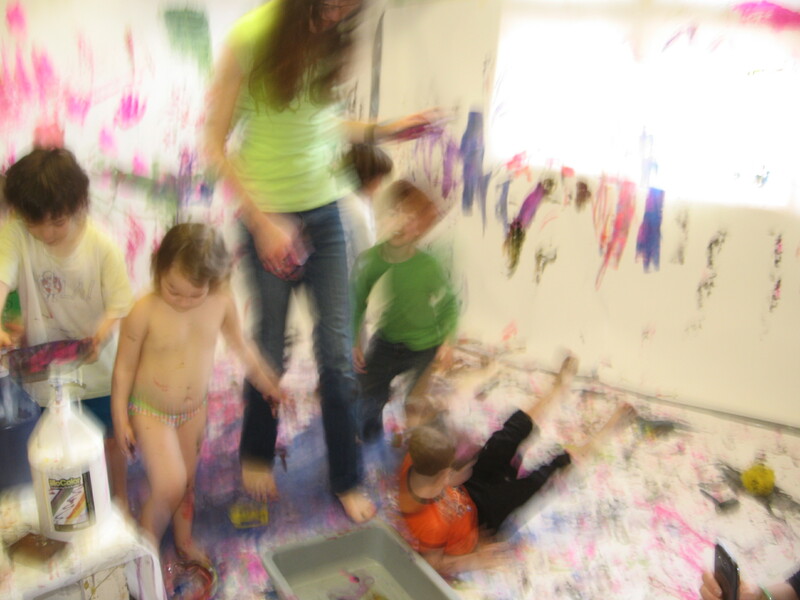 Everything becomes a paint brush: brooms, bath scrunchies and eventually the kids themselves. About 45 minutes into it, as the teachers try to change the kids’ clothes and keep the paint contained to one room, I start to question the wisdom of the painting. Does it have to be so big? Well, yes, it does have to be that big actually. I remember Bev Bos writing about using vinegar and baking soda. She said that it wasn’t enough to have a cup of vinegar, it should be a gallon of vinegar and it should explode. The kids should be wonderstruck. The kids walk into the room covered in white paper. 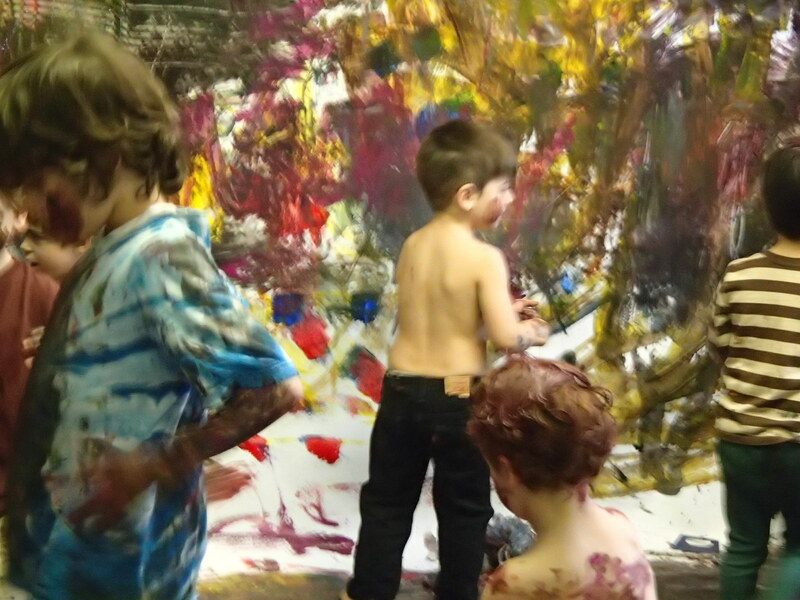 The kids start by pumping paint into pie tins and using brushes. They paint the paper on the walls first. 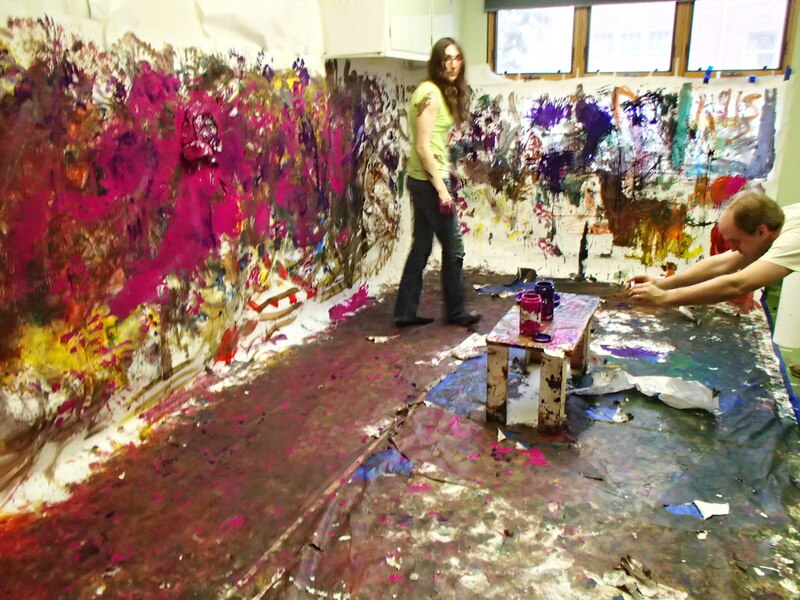 Then someone puts their hand in the paint and spreads the paint around on the walls. When some paint spills, someone will start sliding their feet around. Slowly, kids leave to clean up. As the painting gets less crowded, the kids move around more. The painting turns into dancing. Kids roll around. They paint each other. It gets a bit crazy, but the joy it brings is worth it. We use the paper that photographers use for a backdrop. It’s 9 feet wide and comes in 60 foot and 150 foot lengths, available at photography supply stores. We buy four gallons of cheap tempera paint with pumps. We have brooms, bath scrunchies, pie tins, rollers, feather dusters, etc. We tells parents to send clothes for the kids that might be destroyed. Usually this refers to the way some boys engage in rough-and-tumble play for much of the day and girls don’t. 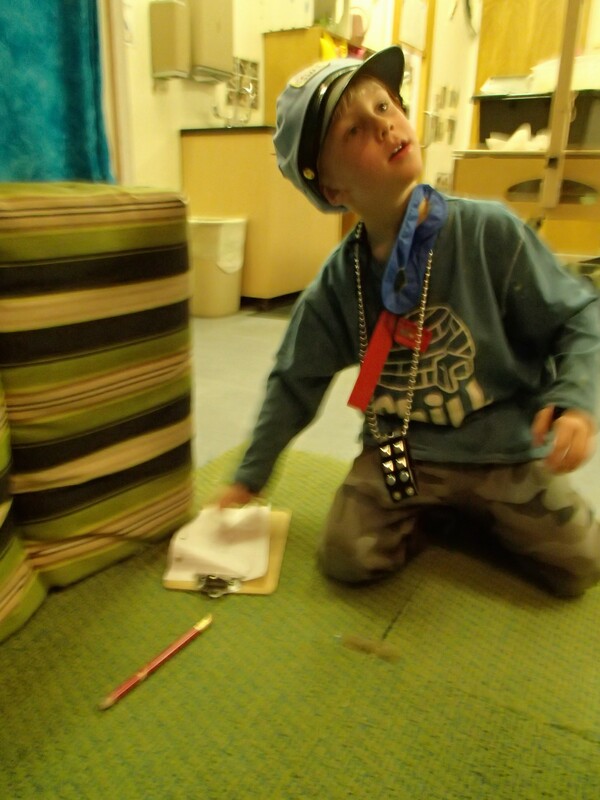 When I talk to other teachers who allow and encourage rough-and-tumble play, I get a very different picture. We all agree that big body play or rough-and-tumble play seems fairly mixed gender-wise. 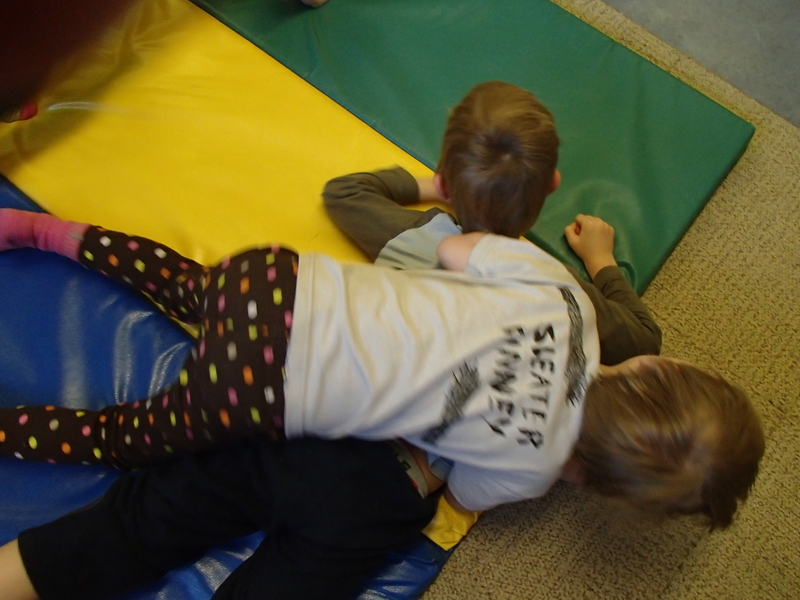 I have 8 boys and 2 girls in my preschool class this year, but about half the time someone asks me to get out the mats for roughhousing, it is a girl. When kids are piled on top of each other, there are girls and boys in the mix. There is research that shows that girls are more likely to engage in rough-and-tumble play when the teacher does. It has been my experience that kids also participate in activities that the adults around them clearly love. It makes sense to me that if a teacher has fun roughhousing, most kids will participate regardless of gender. 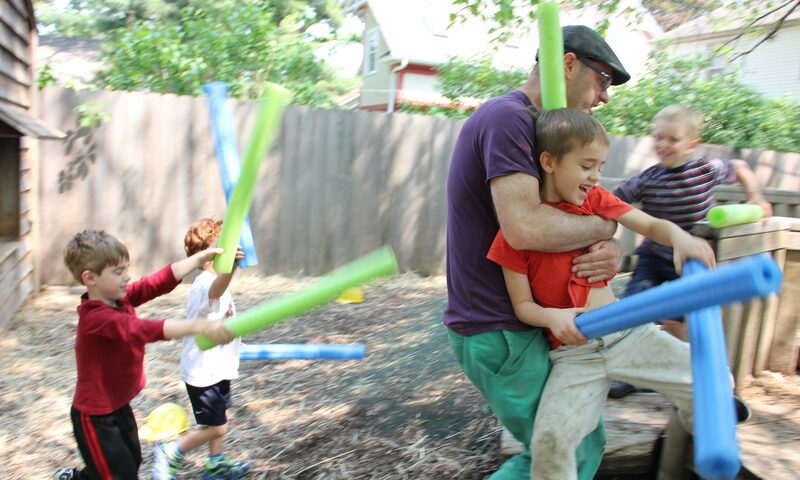 As I work on my book on rough-and-tumble play, I keep thinking about gender, both the gender of the children as well as the gender of the teachers. I am always reluctant to talk about gender and behavior. I think that boys have certain tendencies and girls have certain tendencies, but there is a lot of crossover. In her book Gender Play: Girls and Boys in School, Barrie Thome observed young elementary school students. This age group is known for segregating themselves by gender, but Thome found that the vast majority (80%) of boys played with girls and the same percentage of girls played with boys some of the time. Thome refutes the notion of separate “boy culture” and “girl culture.” Children may show a preference for others of their own gender, but it is not exclusive. This thinking of separate cultures with distinct behaviors can quickly cause adults to become essentialist in terms of gender. For example, in Wired to Move: Facts and Strategies for Nurturing Boys in an Early Childhood Setting, Ruth Hanford Morhard suggests teachers “give boys opportunities for physical contact,” but then goes on to say, “Make sure the boys understand this kind of physical contact is fine with boys, but not with girls.” This otherwise excellent book makes the mistake of conflating a tendency of boys (and girls) into an absolute truth about the genders. There are boys who would not be OK with this contact and there are girls who would enjoy it. And yes, there are children that are perceived to be boys who may not have come to their full gender identity as a girl (or vice versa). All children need the freedom to move their bodies in the way they choose while respecting the rights of others regardless of gender. This means that many boys will crash their bodies into other boys, but some girls may be involved in this type of play as well. Having said that, I think that the idea of “boy culture” could be useful. Boys are expelled from preschools at a much higher rate than girls. They are referred for special needs at a much higher rate as well. Meanwhile the teachers are almost exclusively women (at least 95% depending on what statistics you use). I am not claiming that there aren’t women who “get” rough-and-tumble play. And I am not concerned about how much of a behavior is learned and how much is biological. I am merely talking about the teachers’ responses to the full body expression of many boys and some girls. I also think that there is culture within the field of Early Childhood Education with a wide array of variations within this culture. There is a tendency to favor sitting and reading books over other storytelling media (storytelling, acting, video). 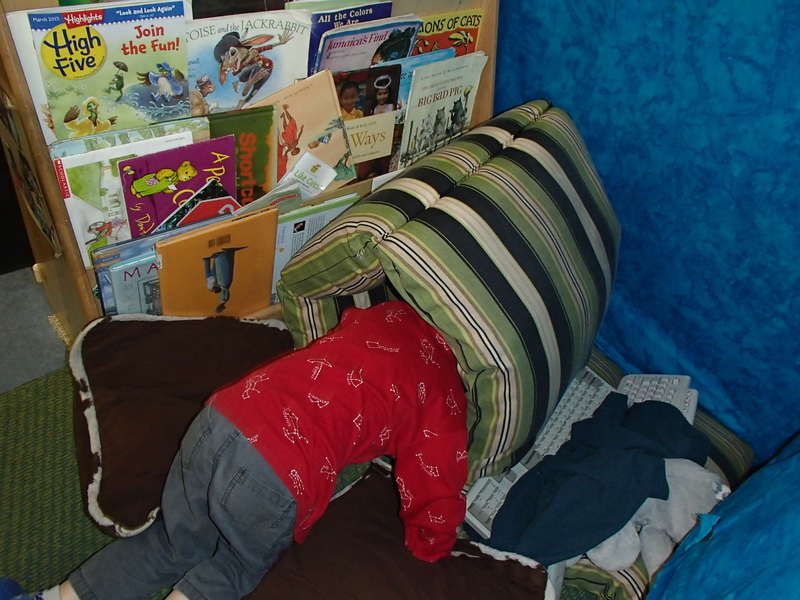 There is often a rejection of certain types of play such as violent-themed play and roughhousing that is common among boys. The result is a culture clash. None of this is intentional. Many of these teachers may not have had the need to move as much as many of the boys (and some girls) in their classrooms. I am not implying that teachers are intentionally not meeting boys’ needs but rather they are unknowingly using their cultural expectations to determine what is acceptable. This becomes more pronounced when looking at African-American boys. The vast majority of teachers are white women. The intersection of race and gender present some unique concerns. As stated, boys tend to express themselves with their whole bodies in ways that teachers often view as disruptive. 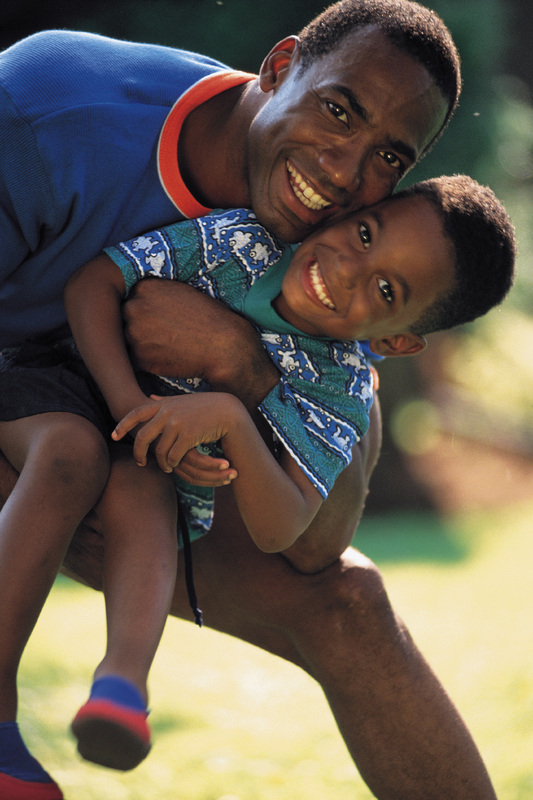 When African-American boys are behaving boisterously, the teachers might not only view it as disruptive, but they may attach some intentionality to it. They may perceive a child as being aggressive when they play this way, or perhaps even defiant. I think white boys are given a little more latitude (boys will be boys) even if they are also scolded. I think all teachers need to look at their own preferences and recognize that they may not “get” why kids do certain things. They may be uncomfortable playing certain ways, but they can do it anyways knowing that they are trying something from a different “culture” that can be appreciated and accepted. They can let kids be kids.